Lyndsay Johnson: Some thoughts on creativity. 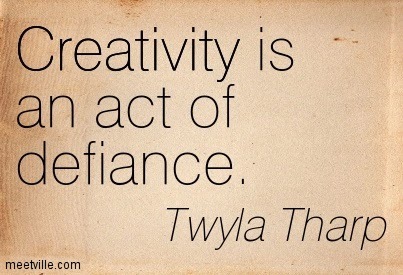 You may have seen this quote from Twyla Tharp: "Creativity is an act of defiance." Sorry, Twyla, but I have to disagree, a bit. I don't see creativity as an act of defiance at all! I think people who oppose creativity—who repress and discourage it—those are the ones being defiant. But the actual act of creating something out of the sheer desire and even need to do so? That's harmony. We are born creative beings. And I believe we are modeled in the image of a creative being. The entire universe IS creativity. Even when things seemingly fall apart, there is energy there. There is change and motion, and that is also creation. To be creative is to be original, inspired, experimental, innovative, and even resourceful. This is the essence of who we are (or at least who we are meant to be). When I put a part of myself out into the world, I am not fighting against anything. I am sharing. I am evoking, revealing, declaring. I am drawing out a part of myself that is innate and important. Essential. I am joining a bigger movement—the inherent forces all around that propel us forward together. It is not defiance. It is truth. Feel free to disagree with me. Respond, interact. Decide for yourself. Be creative.